What should I consider in my ad serving and adjust? AdSpirit generally supports the use of HTTPS / SSL. To use HTTPS, it is sufficient to adapt the advertising space codes by replacing http by https. This applies to both scripting and iFrame placemet, as well as codes from the Code Center. Note: If the advertising area codes are used as HTTPS, are delivered by AdSpirit exclusively creative, which are also marked as HTTPS / SSL-enabled. Please make sure this is the case with the relevant advertising material. All advertising materials that are not marked as an HTTPS / SSL-capable not delivered in this case AdSpirit. To an advertisement to deliver on a HTTPS Web page it must be marked as HTTPS / SSL-enabled (see advertising medium settings). If an advertising medium as HTTPS / SSL marks capable AdSpirit is in the delivery automatically all found URLs by rewriting "http:" to "https." 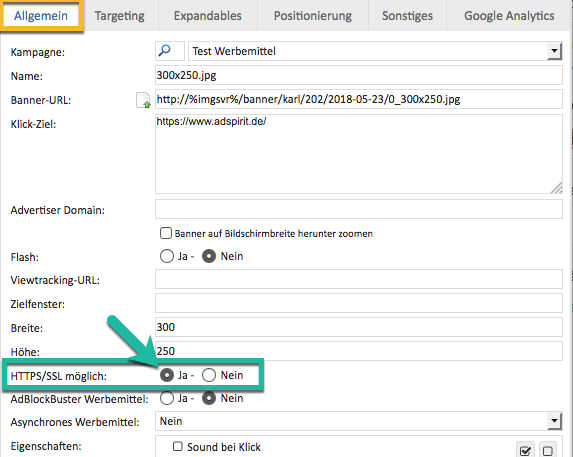 This may mean that certain URLs are no longer functional, since some servers use a different domain for HTTPS (but eg http://www.meineseite.de https://secure.meineseite.de). Therefore, make sure that the code HTTPS-compatible URLs are included and set best already all URLs from "http" to "https:" in order.